Thanksgiving is almost upon us. I’m already dreaming of all the delicious food that I know will grace our table on the big day. But when it comes to leftovers, they can start to get a bit old after a couple of days. I love unique ways in which to use the leftovers so they don’t actually feel like leftovers anymore. 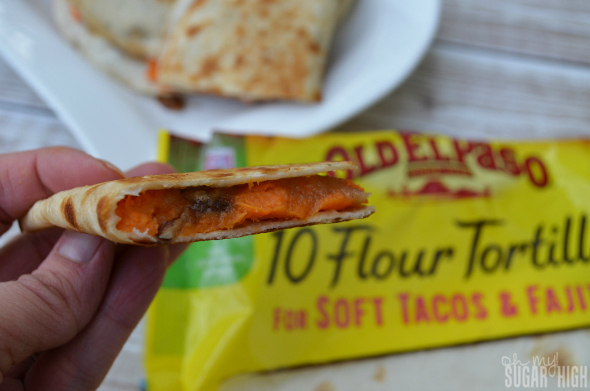 General Mills challenged me to come up with a non-traditional recipe using their Old El Paso tortillas and the very first thing I thought of was a quesadilla. I wanted to make it a bit sweeter so I paired one of my favorites, sweet potatoes with praline topping. The results tasted phenomenal. And even my 20 month old who isn’t a big fan of sweet potatoes anymore absolutely loved these. Give them a try! Heat griddle, crepe pan or 10 inch skillet on medium high heat. Make praline topping by mixing brown sugar and flour in small bowl. Cut in cold butter with pastry blender or two forks. Stir in pecans. Once griddle or skillet is warm, brush one side of 1 tortilla with some softened butter. Place butter side down in same skillet. 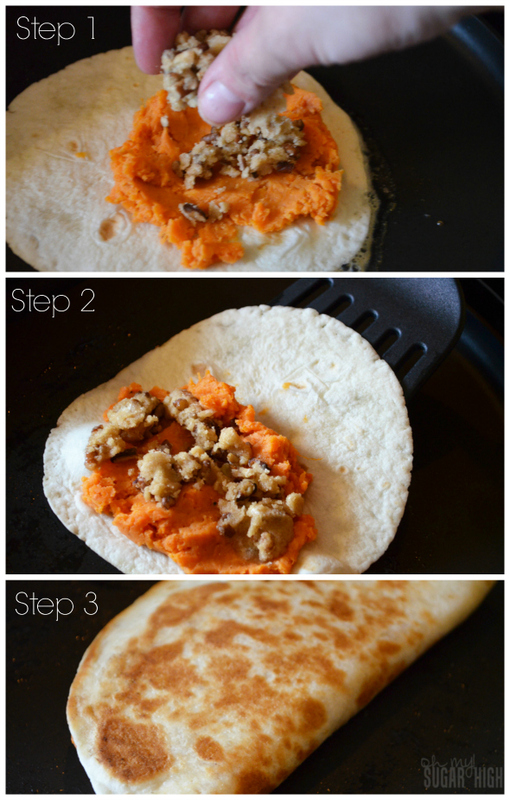 Quickly layer with 2 heaping tablespoons of mashed sweet potatoes on half of the tortilla. Sprinkle praline topping, about a full tablespoon over the sweet potatoes. Spread within 1/2 inch of edge of tortilla. Fold over half of the tortilla. Cook until bottom is gold brown. Flip over to continue cooking until both sides are golden brown. (About a minute or two on both sides.) 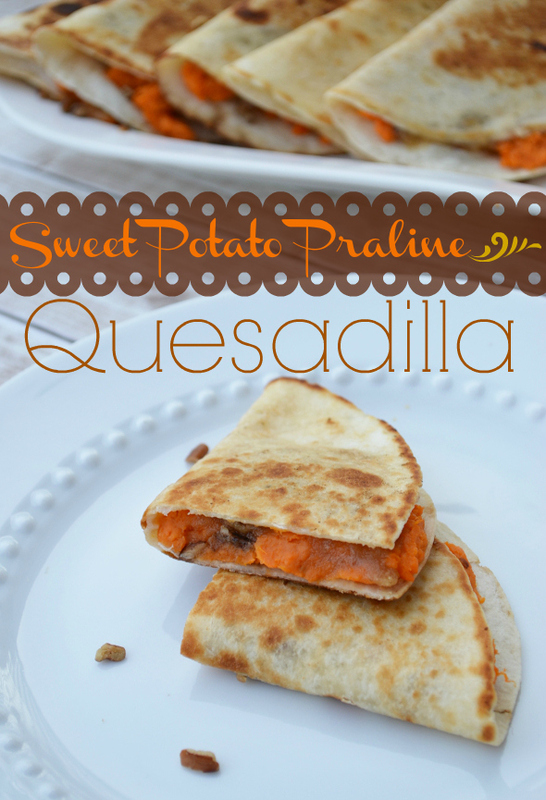 Repeat with remaining tortillas, sweet potatoes and praline topping. Cut quesadillas in half and serve immediately. This really is a very simple recipe, especially if you are familiar with making quesadillas already. And because they can be made in so many different ways, feel free to switch out my quesadilla method with your own. This is the perfect combination of savory meets sweet. Use larger tortillas and simply cut into thirds or fourths. You can also use one tortilla on top of another if preferred. Oil brushed on the tortillas can be used in place of butter. 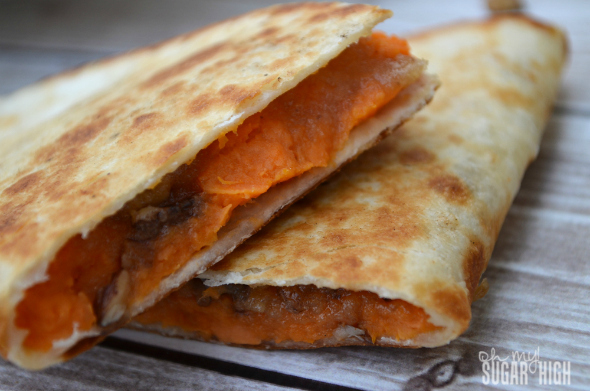 For a savory quesadilla, top mashed sweet potatoes with black beans and/or veggies and top with your favorite shredded cheese. 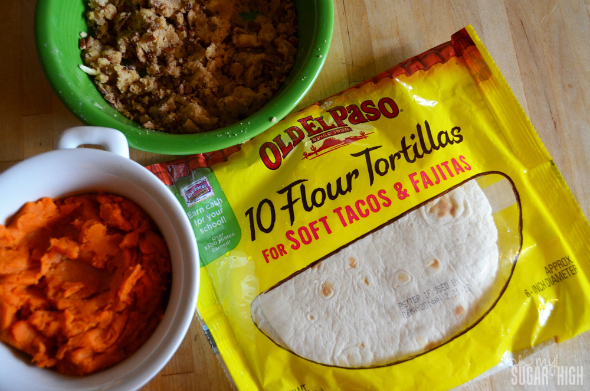 Visit Old El Paso for more great recipe ideas and to browse their other products. Perhaps you can find some more inspiration for your holiday leftovers! This is a sponsored post however all thoughts remain my own. You’ve combined several of my favs in one yummy dish! Pinning and will be making this! What a unique dish! Great way to use Thanksgiving leftovers! !